1. The era of Sriwijaya Kingdom. sukhacitta di pañcamī śuklapakşa vula…. laghu mudita dātammarvuat vanua …..
(Note: The / v / in a modern Malay / b /). Palembang city also held by the community wither as its ancestral land. Because this is the place in the city decrease embryo of the first Malay prince Parameswara who came down from Bukit Siguntang. Then leave Parameswa Palembang with Sang Nila Utama Tumasik to go in and give a name to the Singapore Tumasik. During the Majapahit troops will attack from Singapore, Parameswara with followers moved to Malacca on the Malaysian peninsula and established the kingdom of Malacca. Some of his descendants also opened a new land in the area of Narathiwat and Pattani (now the southern part of Thailand). 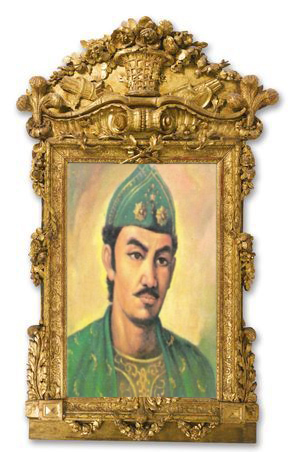 After the contact with the traders and the people in Gujarat and Persia Malacca, Parameswara then convert to Islam and change the name to Sultan Iskandar Syah. Talking about the origins of the city of Palembang, that can not be disengaged from the historical development of the Kingdom of Sriwijaya, who once made the city as the capital of Palembang. Sriwijaya triumph seems revealed to the Sultanate of Palembang Darusallam medium at the time of the patriarch was over dikawasan archipelago. Palembang been functioning as the center of the medieval kingdom of Sriwijaya to-7 (year 683 BC) until about a century to under-12 Sailendra Sailendra / derivative Dapunta Salendra with Bala Putra Dewa First as King. In the 17th century the city became the capital of Palembang Palembang Darussalam Sultanate diproklamirkan by the Prince Consort Kimas Hindi Sri Susuhanan Abdurrahman Candiwalang Khalifatul Believers Sayidul Faith (better known Kimas Hindi / Kimas cinde) as the first sultan (1643-1651), apart from the influence of the kingdom Mataram (Java). On 7 October 1823 Sultanate of Palembang eliminated by Dutch colonists and the city of Palembang Komisariat made under the Dutch Government (the contract of 18 August 1823), with Commisaris Sevenhoven officials as the first Government of the Netherlands. Then the city of Palembang as Gameente / haminte based stbld. No. 126 years in 1906 on 1 April 1906 until the entry of Japan on 16 February 1942. Palembang Syi who co-chaired Syi (Mayor) took place from year 1942 until the independence of RI. Based on the decision of Governor Kdh. Tk. I Sumatera Selatan No. 103 in 1945, City of Palembang as Class A. Based on the Law No. 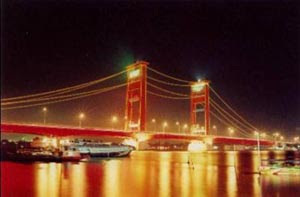 22 Year 948, Palembang City is made of. Based on the Law No. 18 Year 1965, Palembang Municipality is made. Based on the Law No. 5 Year 1974 on 23 July 1974 on Main-Main Region in the Government, Regional Municipality of Palembang as Level II, Palembang.